This topic provides an overview of the structure and components of Diego, the container management system for Cloud Foundry. To deploy Diego, see the GitHub Diego-Release. Diego is a self-healing container management system that attempts to keep the correct number of instances running in Diego Cells to avoid network failures and crashes. Diego schedules and runs Tasks and Long-Running Processes (LRP). For more about Tasks and LRPs, see How the Diego Auction Allocates Jobs. You can submit, update, and retrieve the desired number of Tasks and LRPs using the Bulletin Board System (BBS) API. The Cloud Controller sends a request to the BBS API. The BBS contacts the Auctioneer to create an Auction based on the desired resources for that LRP. The Rep accepts the Auction request. The Rep creates a Garden container and executes the work encoded in the Tasks and LRPs. This work is encoded as a generic, platform-independent recipe of composable actions. The Converger periodically analyzes snapshots of the desired state of the system and corrects discrepancies, ensuring that Diego is eventually consistent. Diego sends real-time streaming logs for Tasks and LRPs to the Loggregator system. Diego also registers its running LRP instances with the Gorouter to route external web traffic to them. 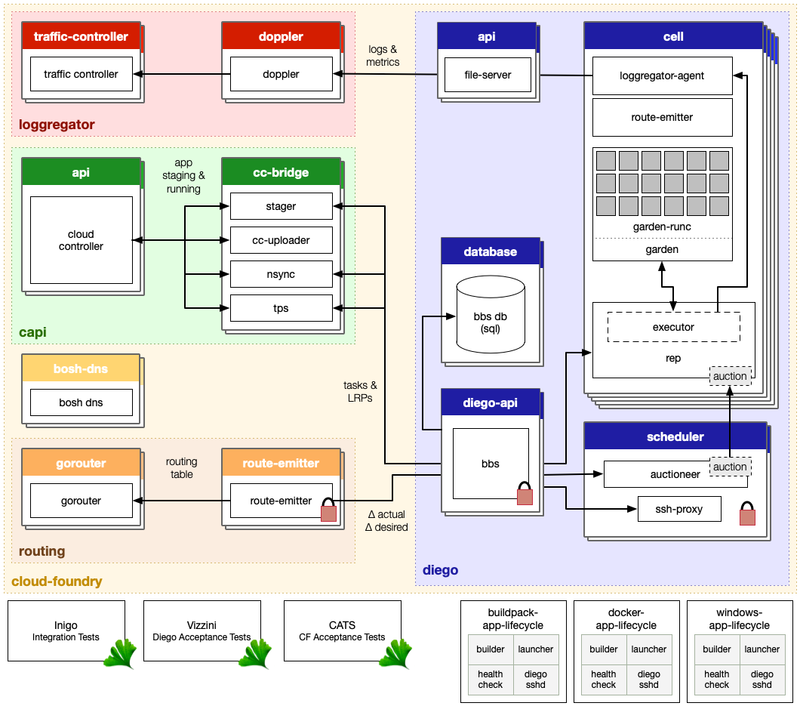 The following summarizes the roles and responsibilities of various components depicted in the Diego architecture diagram above. Forwards app logs, errors, and app and Diego metrics to the Loggregator Doppler component. Monitors DesiredLRP and ActualLRP states. Periodically emits route registration and unregistration messages for instances running on the local cell. Diego Brain distribute Tasks and LRPs to Diego Cells and corrects discrepancies between Actual and Desired counts to ensure fault-tolerance and long-term consistency. The Diego Brain consists of the Auctioneer. Distributes work using the auction algorithm. Auction communication is sent between the Auctioneer and the Cell Reps over HTTPS. For more information about the auction algorithm, see How the Diego Auction Allocates Jobs. The Builder, which stages an app. The CC-Bridge runs the Builder as a Task on every staging request. The Builder performs static analysis on the app code and performs any necessary pre-processing before the app is first run. The Launcher, which runs an app. The CC-Bridge sets the Launcher as the Action on the DesiredLRP for the app. The Launcher executes the start command with the correct system context, including working directory and environment variables. The Healthcheck, which performs a status check on running apps from inside the container.